Okay, ReinasMomma AKA Scary Spice...send me your physical address via email so I can send the fun little album out to you!! And Congrats! Now to share with you a scrap page I made yesterday. 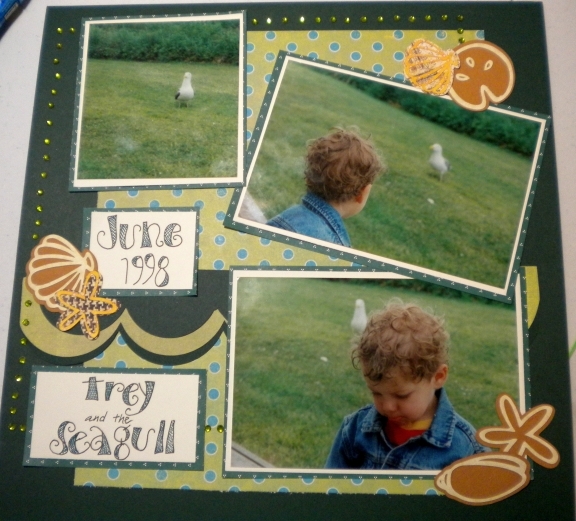 This one was of my son Trey (now 14) and a vacation we had while visiting the Oregon coast. (my hometown) He and a seagull were having an interesting time together seeing who could stand their ground better. I am not sure who won the battle. I hand-lettered the words on the page. And added some gemstones with my I-Rock tool to frame everything a little bit. The seashells were made with the Stretch Your Imagination Cricut Cart and the scallop was created with the Plantin Schoolbook cartridge. FYI: If you set the dial to 1 3/4" size it will make a scallop that utilizes the whole width of your 12x12 paper. 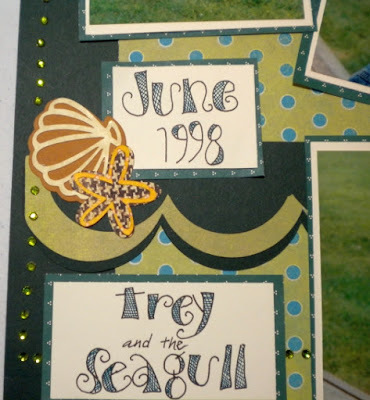 Go take a look and enter your scrap page idea before midnight October 19 and you could win a fun prize! !